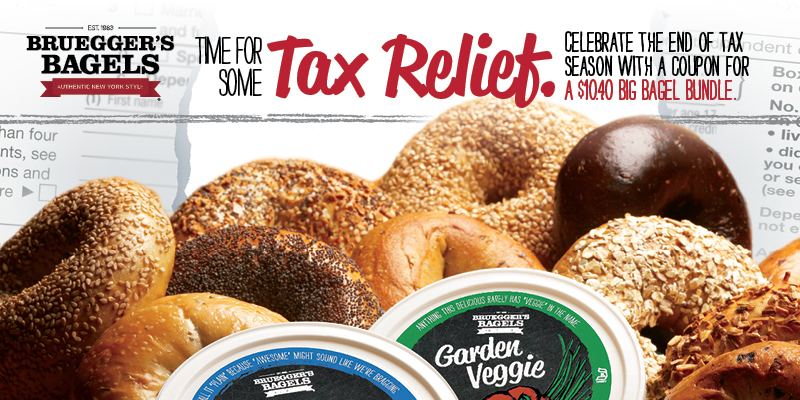 Bruegger’s Bagels is once again giving guests its annual Tax Day break on its Big Bagel Bundles. April 15-18, Big Bagel Bundles are just $10.40 – about a $3.50 “deduction” – for those who visit Bruegger’s Bagels’ website to claim the offer. Each Big Bagel Bundle includes the guest’s choice of any 13 bagels from among Bruegger’s Bagels’ 15-plus authentic, New York-style bagel varieties, along with any two tubs of 100 percent made-in-Vermont cream cheese flavors. Guests may choose the limited-time Ranch Bagel, featuring the familiar flavors of its namesake dressing including tangy buttermilk, sour cream, dill, garlic, onion and chives. The Ranch Bagel pairs perfectly with the cool cucumber and zesty dill in Cucumber Dill Cream Cheese. To qualify for the “deduction,” guests can download the offer at www.brueggers.com starting April 11. Guests also can join the Bruegger’s Bagels eClub to receive a free bagel with cream cheese and other valuable offers throughout the year. Bruegger’s Enterprises, Inc. (BEI), a leader in the fast casual restaurant segment, operates 275-plus Bruegger’s Bagels bakeries in North America. Renowned for its authentic New York-style fresh-baked bagels, the chain also offers a wide variety of freshly prepared breakfast and lunch options made with high-quality, simple ingredients served with its unique brand of hospitality. Bruegger’s Bagels is dedicated to the communities it serves and supports charitable causes locally and nationally. BEI’s parent company, Groupe Le Duff, SA, is the world’s second-largest company in the bakery-cafe sector. Founded in 1983, BEI is headquartered in Dallas. For more information, visit https://www.brueggers.com/, follow Bruegger’s on Facebook, Twitter, Instagram and Pinterest, and click here to sign up for the eClub to receive news and special offers.